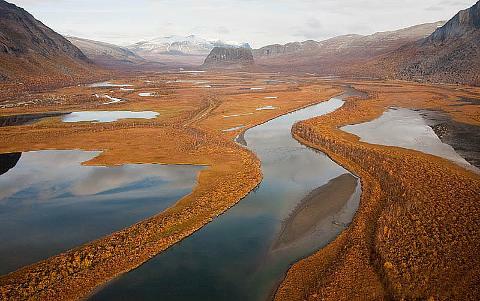 Sarek National Park is the most remote wilderness area in Europe. No roads, no trails, no cabins, just pure nature. 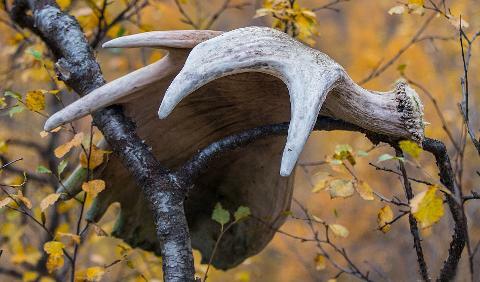 Join this 8-day expedition in search of Bears, Lynx, Wolverines and the largest Moose bulls in Scandinavia. 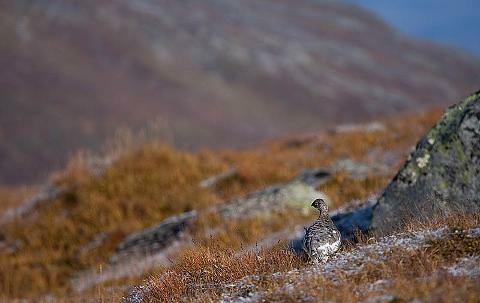 Sarek National Park is often called Europe´s last true wilderness area. A dream adventure for any true nature enthusiast. 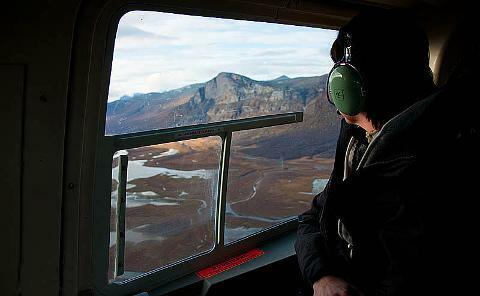 The park has no road access and can therefore only be reached on foot or by helicopter. We will be dropped at the border by helicopter to save us some days of hiking and give us more time inside in the more remote areas of the park. Once we are in there, there are no marked trails and no access to huts or shelters and no mobile phone coverage. It will be just you, nature, some fellow adventurers and plenty of wild animals until the helicopter pick us up again at the end of the trip. 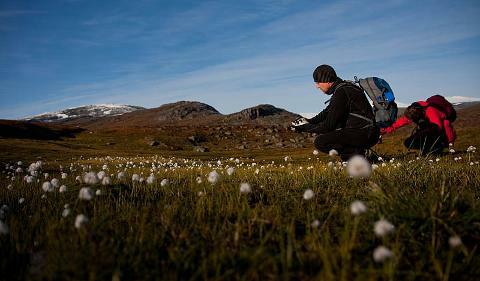 This is a hiking trip for active nature lovers in one of Europe´s most remote areas. There are no trails, cabins or bridges across streams and rivers. You will have to carry the most essential equipment such as camping gear, clothing and food, which means your backpack will be rather heavy, approx. 18-25 kg depending on your personal equipment. Drinking water is available in the streams along the way so you don’t need to carry any water. 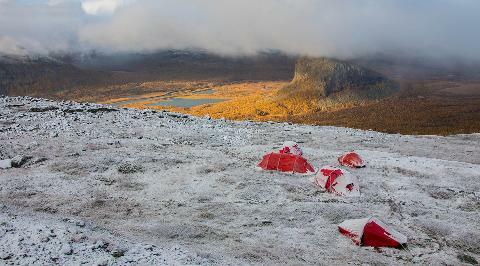 We will hike, camp out and spend some adventurous days out together in the most dramatic parts of Sarek National Park in the valley of Rapadalen. Rapadalen is home to Brown Bears, Lynx, Wolverines, Golden Eagles and other large carnivores. 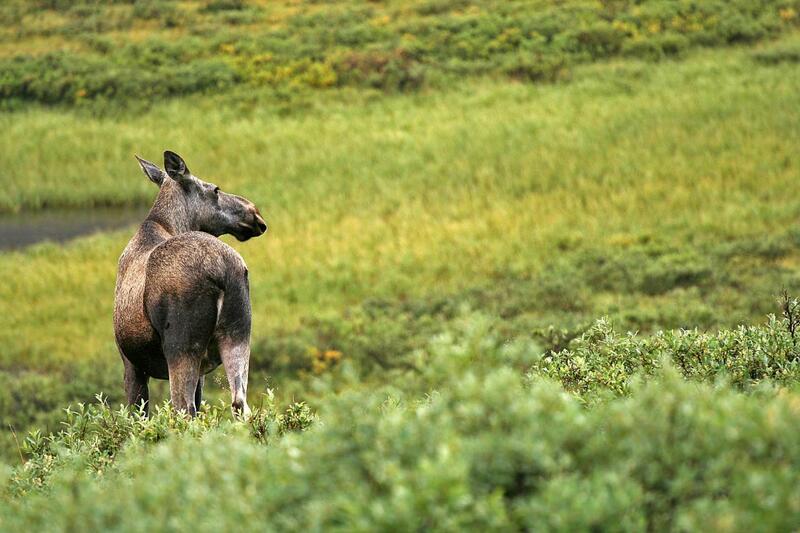 But it is also known to be home to the largest Moose in Europe. 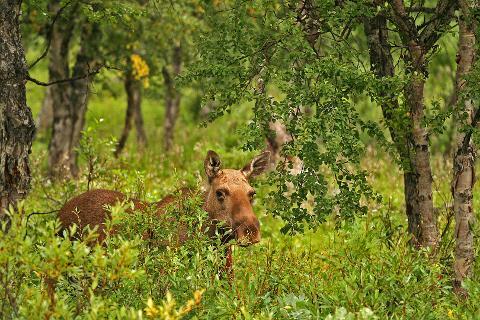 Since no hunting has been allowed for a long time, these Moose are less afraid of people. And during September when they have their rutting season they are busy finding mates which makes them even less cautious of people. So end of August and September is the ultimate time to go. And with just a bit of luck you can get close to these majestic animals. 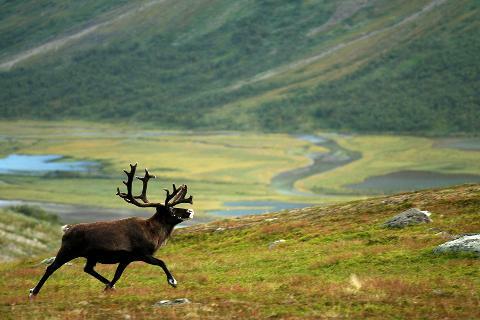 Sarek National Park is the remotest parts in the Laponia area. Laponia is a huge mountainous wildlife area in Lapland in northern Sweden that became a UNESCO World Heritage Site in 1996. 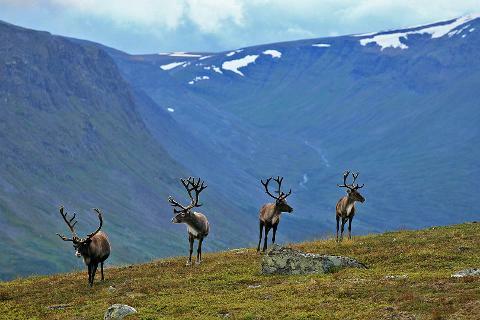 With a total area of 9400 km² it is the world’s largest wilderness area that is still cultured by natives, the reindeer herding Sámi people. Sarek is impressive with its deep cut valleys between high, jagged peaks. There are hundreds of mountains over 1,800 meters. 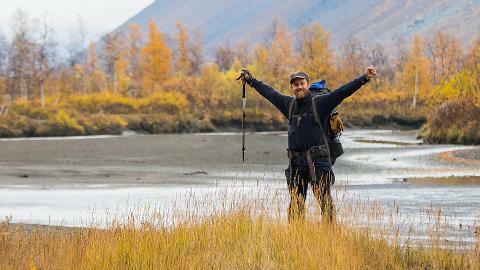 The contrast between rocky mountain sides, fractured glaciers and lush valleys makes for adventurous hiking. Sarek is not risk-free, but we will take good care of you and make sure we bring all necessary equipment; waterproof tents, warm sleeping bags and a portable satellite phone etc. Known as Lapland, the native name of this area is Sápmi. The Sámi people are the indigenous people inhabiting the Arctic area of Sápmi, which today encompasses parts of northern Sweden, Norway, Finland and the Kola Peninsula of Russia. During this tour you will have the chance to visit the Ajtte museum where you can learn about the Sámi culture and traditions. How heavy will this be? The amount of walking is adapted to the groups abilities as well as the current weather conditions and the terrain. We hike gently carrying our backpacks, partly up on a mountain plateau where hiking is easy and partly in the lush valley on almost non-existent trails made by the wild animals that inhabit this valley. You need to be aware that this may become heavy, so you need to be fit and in a generally good condition. But, this is not a survival expedition, so we will do a lot of breaks along the way. We are here to enjoy! We stop to drink water from the streams, boil coffee, take photos and share our life stories. On some of the days we will just do day trips from our camp without our heavy bags. We will treat ourselves with several coffee breaks each day, pick berries, take time for photography and spend lazy evenings by the camp fire. On some of the days we will just do day trips and leave our backpacks at the camp. In this way we will be able to experience Sarek in a relatively easy way. Meet our guide at Luleå airport or arrive directly to Jokkmokk by night train and a connecting shuttle bus. We all meet up at Jokkmokk guesthouse in the late afternoon, a one-hundred-year-old guesthouse which will be our base for this expedition. Together we enjoy a welcome dinner where you will also have the chance to get to know us your guides and the other participants. We will then need a few hours of equipment check to make sure we are all ready for the following days out in the wild. Enjoy your night at Jokkmokk guesthouse. Tomorrow the adventure begins! Early breakfast, backpacks in the minibus and off we go! 1,5 hours later we arrive at Stuor Muorkke in Stora Sjöfallet National Park where a smiling helicopter pilot says hello. Sit back on the wooden bench, turn off your phone and have a coffee while the pilot prepares the helicopter for takeoff. 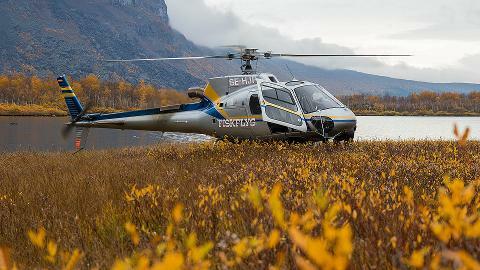 The short helicopter flight (20 minutes) will take us to the Rapadalen valley at the border of Sarek. It saves us at least 20 km of hiking and gives us more time to explore National Park. Once we are all on the ground we begin our hike to enter the park on foot. On this first day we only walk for a few kilometers carrying our own backpacks. We put up our tents by the river and enjoy our first outdoor dinner surrounded by majestic snowcapped mountains. First night in our tents. After breakfast we pack our tents and continue our hike along the river Rapaätno, which will take us deeper into the valley. Hiking here is easy with flat terrain but with an ever-changing view over the surrounding mountains. We continue our hike on animal trails along the river through the lush birch forest. We are not in a hurry and we take many breaks to watch for wildlife. This is where Moose gather up at this time of the year for the rut. We search for tracks and move in silence to increase our chances to encounter any wild animals. Chances are good that we will have some exciting up-close encounters with Moose. You may also see Reindeer, eagles, Rough Legged Buzzard and for the lucky few even Wolverines and Brown Bears through your binoculars. We enjoy an outdoor lunch and treat ourselves with several coffee and photo breaks. It is a fantastic feeling just being here. In the afternoon we settle down at a nice spot with good viewing possibilities and set up our tent camp. We cook a dinner under the stars and share our stories. Our second night in tents. If the sky is clear, remember to open your tent and watch for Northern Lights every once in a while during the night. We will spend three days in Sarek's amazing nature and each morning you will hopefully be reminded how privileged you are to be here. We will spend the days hiking, tracking, watching, photographing and having fun. But moist boots and cold temperatures can sometimes make it feel tough. So, don’t forget to relax and stretch out on your mat and watch the clouds rise above the mountain tops and enjoy the silence. Take a deep breath and taste the fresh air. Wash your face in a cold stream of fresh water. Not quite awake yet? Don't worry, we can always boil some more coffee. Strong coffee. We have time. If everything is going according to plan we may leave the camp behind for one or two days and go for day hikes without having to carry our heavy backpacks. If weather permits, we may hike up the famous Nammatj mountain on one of the days. 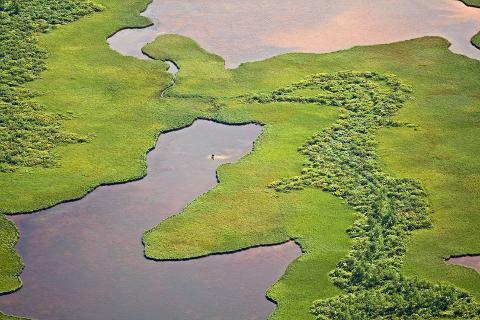 On clear days we will have amazing views across the river delta. From up there you can usually spot moose grazing along the river. You don’t want to leave! That’s usually the feeling you get on the last day. Or perhaps we are all wet and tired and can't wait to return to civilization. We use this day to hike and enjoy the park as much as we can before its time to go. Listen for the sounds of the helicopter to come and pick us up for our return. Minivan transfer to Jokkmokk where we return to the same guesthouse where we stayed on our first night. Enjoy a well-deserved shower and served dinner before we conclude our adventure. Night at Jokkmokk guesthouse, in soft beds, oh heaven! There will be max 7 persons with one guide. With two guides there may be up to 12 participants. Full board from dinner day 1 until breakfast day 8. The first and last nights at Jokkmokk guesthouse, with standard single/double/twin room with shared bathroom. Five nights in tents, single or double. To reduce weight, you may choose to share tent with other participants of your own gender, if you like. We provide the following top-quality outdoor sleeping equipment: Lightweight tent, sleeping bag (3-season Nordic climate) and sleeping-mat. Jokkmokk. You will be back at Luleå airport at around 11 AM on departure day, so don't plan for any return flight earlier than 1 PM. You can also choose to stay an extra night in Luleå town before you return home. In that case we will take you to your hotel. There is a fee of 1500 SEK per person for the transfer from Luleå with return. If you arrive by car or public transport meet up your guide and the other participants by 5 PM at Jokkmokk guesthouse. The most environmental friendly option. We highly recommend the night train from Stockholm to Boden or Murjek. From Boden or Murjek you have bus connection to Jokkmokk. From Jokkmokk station it is just a short walk to the guesthouse. This overnight train may sound like a long way to travel, but it is a great trip and part of your adventure! You usually meet some fellow travelers on the train. Air: Fly via Stockholm (ARN) to Luleå Airport (LLA) with SAS or Norwegian. Before you book, make sure you read all information about this tour, such as tour conditions and what is required of you as a participant. Don't hesitate to contact us if you have any questions. Note! We will manually review the booking to make sure that the minimum number of participants is reached to conduct the tour. We will confirm availability within the shortest possible time after we receive your order. Until your booking is confirmed no payment or charges will be applied, and credit card details are held for security purposes only.